During the past 40 years state governments have maintained a commitment to the arts, establishing arts agencies in all 50 states and allocating funding — even during recessions — to their programs. Why? The arts are an important policy asset and a prosperity generator for states. In addition to their inherent value to society, they offer a distinctive blend of benefits that includes economic drivers, educational assets, civic catalysts and cultural legacies. Twenty-seven states have laws that provide funds for the acquisition, commissioning and installation of works of art for certain new or renovated public buildings. Among them is Ohio, which established the Ohio Percent for Arts Program in 1990 to foster culture and the arts and encourage the development of artists and craftspeople. Whenever the Ohio legislature appropriates more than $4 million for a public building, the Percent for Arts law requires one percent of the total appropriation to be allocated for artwork. Since the legislation went into effect, over 200 projects have brought public art into cities and small communities around Ohio. The Ohio Arts Council determines the eligibility status of public building projects and acts as a liaison between the artist and contracting agencies. Artists interested in participating in the Percent for Art Program are selected through open competition or juried invitational or are selected by a curator. 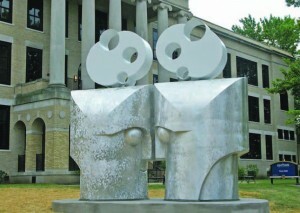 After making improvements to several buildings on campus, Kent State University used the money allocated for artwork to create a sculpture walk along the University Esplanade, the pedestrian walkway through campus. A 13-member committee that included staff members from Kent State’s Office of the University Architect, university employees, two members from the local art community and a regional member from the Cleveland area, along with the Ohio Arts Council, chose the artists from a pool of Ohio artists. The city and community will be adding more art to the walk as Kent’s downtown development project continues. Several pieces have already been commissioned by developer Ron Burbick for inclusion within Acorn Alley, a retail section of downtown Kent. For a list of all the Percent for Art programs throughout the United States, visit the National Assembly of State Art Agencies at www.nasaa-arts.org. 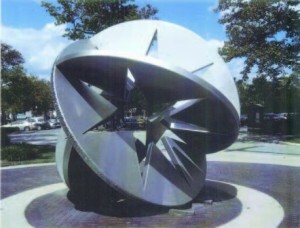 For more information about public art projects, visit Americans for the Arts at www.artsusa.org.